While districts regularly make placement decisions regarding all core subjects (math, English, science, social studies), one area is most significant: math. Most universities (including California State and University of California) require at least three years of math for college eligibility, and they prefer students who have taken highlevel math courses such as Calculus or AP Statistics. However, such high-level math courses are generally only available to students who begin high school in Geometry. Ninth grade math placement can therefore not only have far-reaching impacts on a student's confidence, general knowledge of mathematical concepts, and high school experience -- more importantly, it can impact the college and life opportunities available to that student. This report is intended to call attention to the math misplacement issue; to educate districts, community members, and parents about the potential liability associated with such placement decisions; and to encourage districts to take relatively simple steps to remedy the problem of math misplacement. 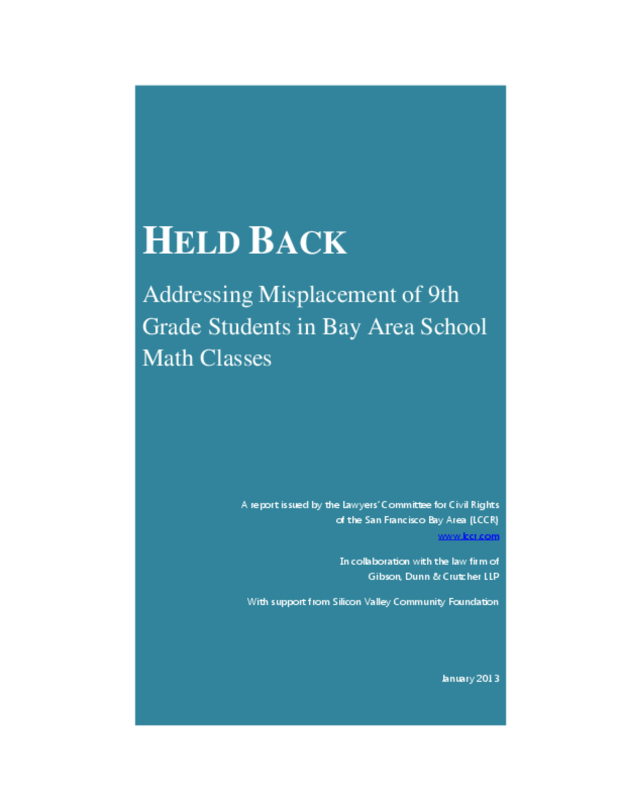 Part I of this report explores the problem of math misplacement in greater detail and reviews the publicly available data regarding 9th graders' math class placement in school districts in San Mateo and Santa Clara counties. Part II explains the disparate impact doctrine and demonstrates why a district that engages in math misplacement, even if unintentionally, puts itself at legal risk. Part III explores other possible bases of legal liability. Finally, Part IV presents practical solutions to the problem of math misplacement and provides recommendations for school districts, community advocates, and lawyers to follow to remedy this critical civil rights issue. Copyright 2013 Lawyers Committee for Civil Rights, The.